No two golfers are alike and no shaft is one-size-fits-all. The new SteelFiber FC ‘Flight Control’ graphite iron shafts combine the advanced composite technology of SteelFiber with variable tip stiffness for players who need higher trajectories. The new progressive tip design of the SteelFiber FC shafts delivers higher ball flight in the mid- and long irons while maintaining the classic SteelFiber launch in the scoring irons. Plus, like all SteelFiber shafts, the FC reduces the risk of injury, lessens aggravation of existing injuries and decreases player fatigue, all while delivering greater distance and accuracy. 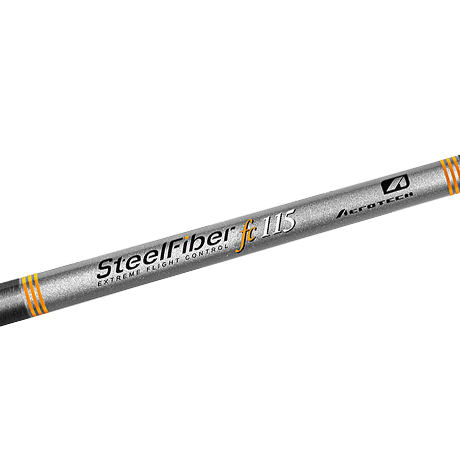 At 115 grams, the SteelFiber fc115 provides an easy transition for players previously using full weight steel shafts, and is available in both taper tip and parallel tip configurations. All taper tip models are ‘Constant Weight’ therefore each shaft within the set weighs the same, regardless of length.